The minar, a larger version of the minaret, is a tower belonging to a mosque from which the call to prayer is heard. 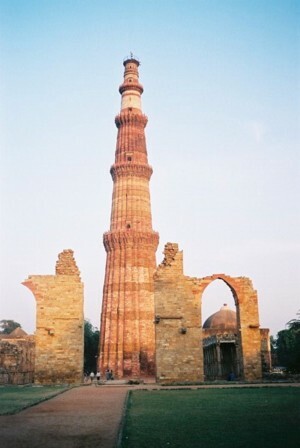 The Qutb Minar of Delhi stands on the outside of the cloistered courtyard of the Qutb Mosque, also known as Quwwatu'l Islam. The extreme height of the Minar makes it impractical for calls of prayer.